Friday September 28th is the fifth anniversary of the 10X10 Art Exhibit and Sale. My two watercolors are among the 325 works by local artists. This benefit will fund an artist-in-residence program in Brunswick elementary schools. There will be a silent auction too, including works by Bowdoin College professors, Mark Wethli and John Bisbee. Local restaurants have donated hors d'oeuvres. Come join us! 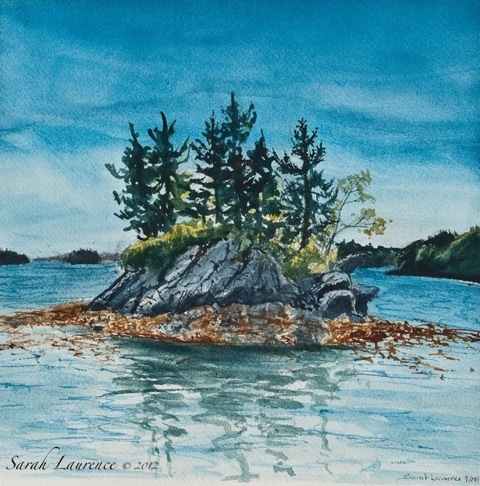 Lookout Point in Harpswell is one of my favorite places to paint. but at high tide the trees nearly drown. As the tide rises, seaweed floats like long hair. A reflection of trees develops on water, undulating in the current. My initial sketch was submerged in water and in paint. It was a challenge to fit a long, flat beach into a square. I searched for vertical elements offshore. but settled for the two with lighthouses. insinuating himself upon the page. Besides public beneficial effect, I believe it's a great opportunity for the local artists to be seen and to present their work, isn't it? I expect a lot of visitors will come to see the show. Sarah, as you write that it was a challenge to fit a long, flat beach into a square, does that mean that you painted those pictures specifically for this opportunity? Petra, it is wonderful to bring all our local artists together. The event is always popular well beyond the elementary school parent crowd. This is my 5th year participating so I knew in advance that my work had to fit in a 10 inch by 10 inch square frame. I only paint squares for this show. That restriction means that all the work goes together like a patchwork quilt, but it's a challenge for landscape artists. I actually painted these two this time last year to capture the best light. Our submissions are due in late August. As for the trees, they are perched high enough on the rocks that they stay dry except during storms. It still amazes me that they can survive in that harsh environment. It's been a while since you posted about this event and I was just wondering about it and your art. You paint so beautifully. What a great idea to promote the arts in schools. I'm sure your paintings will be snapped up quickly. I certainly wish I could return to Maine this September and visit the show. I was wondering: Who decides on the artist-in-residence? I love reading about what you're feeling whilst you're painting as much as the paintings themselves. As a person enamoured of the sea, these two paintings were a very welcome sight. Many thanks and well done to everyone involved in the exhibition. Just beautiful, Sarah. I too like hearing how you feel as you paint. I can imagine myself there observing as you create. Such lovely paintings, Sarah. You're actually teaching me quite a bit about art, Sarah. Knowing what was going through your mind as you were painting this helps me to look at each one with a different perspective. I hope the art show is another success! Every time I walk along a seashore, my soul is full of longing, though for what I'm not sure. 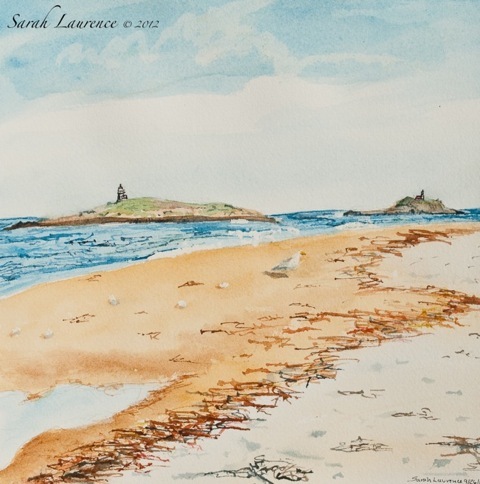 The shells, pebbles, seaweeds on the seashore and the light houses in your painting remind me of that longing. I can even smell the sea breeze from your works. I love beachcombing!! I espcially love the second paiting!! It is really beutiful! Good luck with the 10X10 Art Exhibit and Sale!! What a great event. I love your paintings, especially the Rising Tide one, because I'm fascinated by high and low tides and the effect they have on the surrounding scenery. Gorgeous paintings. We are heading down your way next week but will have come and gone before the 28th. Good luck with the show. congratulations on having your beautiful works be included in this exhibition. i wish i could be there to attend in person. The Rising Tide at Lookout Point is my favorite of these two, especially those trees. I hope both sold Friday night--such a worthy cause and so much local support. Cid, let me know next time you're coming my way. I was out all of this last week painting. All, thanks for your support! The sale went well although neither of my watercolors sold this year. I'll add them to my works for sale through my website along with the new paintings I've done this fall. First I need a day to photograph the paintings outside. My website is more than a year out of date. I'm hoping to do more painting when the sun comes back and before it gets too cold. After that, I'll switch back to writing.